Home SPORTS Mtaa Youth Group fighting crime, drugs through sports and activities. Mtaa Youth Group fighting crime, drugs through sports and activities. Thika Town MP Eng. Patrick Wainaina presenting a trophy to one of the outstanding players in the tournament. In an effort to fight against crime and substance abuse within the Mt. Kenya region, a section of Thika youth have together and organised various social activities which include soccer tournaments that have brought together their peers within Kiambu County. Over the past one week, Mtaa Youth Group have organised a 22-team tournament from across Kiambu County dubbed “SAY NO TO CRIME, CRIME SI POA WACHA FUTAA ICHEZWE” that was hosted at St. Patrick Primary School Grounds. The group, which is now a year old, came up with this initiative due to the high rate of their peers who were getting hooked up in drug addiction and crime, majority of whom ending up in jail or ‘kupewa mchuma’ (shot dead by the police). “Most of our youth are getting hooked to ‘kete’ (cocaine) and are engaging in daring muggings and eventually ending up in jail, being lynched by irate mob or shot dead by the police. This trend is worrying and we had to do something to arrest the situation,” said the group’s Treasurer John Kariuki Wanjiru alias ‘Rio’. Though Rio admits that it has been an uphill task due to unavailability of funds and youth resistance to change, he reckons that the group had made great strides in reforming their peers, consequently reducing the rate of crime significantly around Majengo, Ofafa and Starehe areas where the core of their members hail from. “Our next move will be to take our mission to schools as we attempt to prevent teens from engaging in crime and substance abuse through football,” he said. His sentiments were supported by his colleague Evans Okello aka ‘Coach Wemba’ who appealed to area leaders to support the initiative as a way of bringing together the youth and fighting crime through economic empowerment. “I am appealing to our leaders to support us nature these talents and build a team that can compete in regional and premier leagues. We need sponsors to pay football subscriptions and acquire playing kits,” said Coach Wemba. Area MP Patrick Wainaina who was the chief guest hailed the group’s initiative and promised to assist them achieve their dreams. He requested them to form clusters for economic empowerment and job creation in order to attract more youth out of poverty, crime and substance abuse. “Go form clusters of about 25 members and my office will assist you with the registration and acquisition of government funding and other necessary financial assistance from well-wishers. After that, we are going to train you in financial management and help you take up tenders from my CDF tenders worth about Ksh. 500,000 each,” said the MP. He promised to support and nurture sports and talents in amongst the local youth through various activities initiated by the youth themselves. 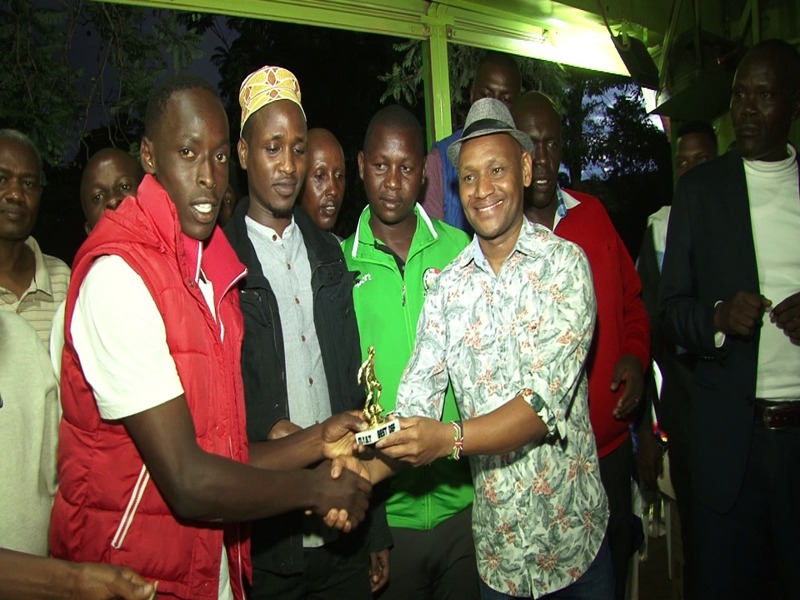 The inaugural tournament culminated on Sunday afternoon with finals between Starehe FC and Islamic FC, both from Thika West Sub-County, where the former won 5-4 on post-match penalties to lift the trophy and a cash award of Ksh. 30,000, all donated by the office of the MP. The runners-up went home with medals and a cash token of Ks. 15,000 with the second runners-up pocketing sh. 5,000. Various players who excelled in their departments were also given trophies and cash awards. Each of the top three teams got uniforms donated by the area CDF office.